As a physician at Northside Medical Clinic/Ortonville Area Health Services, I see many pregnant women who are a few weeks from a full-term pregnancy and are feeling really uncomfortable. Some are ready to schedule a delivery by induction or cesarean section before they have reached their 39th or 40th week of pregnancy. They know friends or family members whose doctors have agreed to schedule such a delivery. But I know that healthy babies are worth the wait. At least 39 weeks of pregnancy are crucial to a baby’s health – and I won’t schedule a delivery before that unless there is a medical necessity. Here at Ortonville Area Health Services, we’ve made a pledge to give babies a healthy start in life. In December 2013 we were recognized by the March of Dimes and Minnesota Hospital Association for this work. We have reduced the number of early deliveries that are medically unnecessary. When the award was received at the beginning of December, OAHS had 67 total births (more since that date) and 15 deliveries of those births were prior to the 39 weeks and only 4 of these were inductions or 6% of our deliveries. All 4 of these inductions were medically necessary. Development of critical organs, including the brain, lungs, and liver, occurs during the last weeks of pregnancy. Research published last year shows the risk of infant death doubles when a baby is born at 37 weeks of pregnancy as compared to 39 or 40 weeks. I have been working with the March of Dimes and our hospital to eliminate the medically unnecessary c-sections and inductions before 39 weeks of pregnancy because all babies deserve the best opportunity for a health start in life. 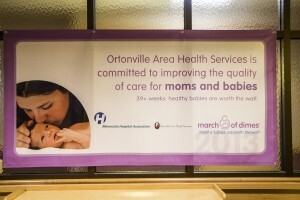 We are proud of this recognition of our work by the March of Dimes and the Minnesota Hospital Association.